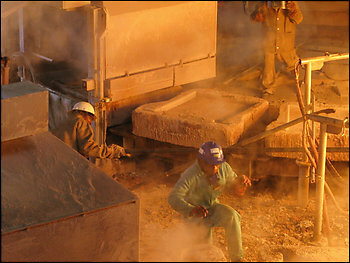 LUANSHYA, Zambia — The global economic meltdown swept into this company town and took down the copper mine in January. It left in its wake a crisis measured in unsold tomatoes at the market, empty stomachs and desperate people lined up outside Chishimba Kambwili’s pink house each morning. Mines here in Zambia’s Copperbelt region drive this poor nation’s economy, but a plunge in global trade has slashed demand for the copper used to construct electronics and houses in the United States and Asia. That is prompting mines here to slow and shut, limiting tens of thousands of Zambians’ access to schooling, health care and regular meals. Africa‘s resource-fueled economies have grown steadily in recent years, improving the lives of millions of people. Now, as prices drop for Botswana’s diamonds, Chad’s oil and Tanzania’s cotton, a crisis that began in the rich world is threatening to drive millions more into poverty, according to the World Bank, and raising the specter of unrest. For laid-off mine electrician Lucas Ngoma, feeding a family of eight has come to mean bartering a DVD player for a sack of dried fish. Of the 26 countries the International Monetary Fund has flagged as “highly vulnerable” to the shocks of the global crisis, half are in Africa. The fund has scaled back its 2009 growth forecast for the continent from 6.7 percent to 3.25 percent. The problem is not just a collapse in commodities prices. Foreign investment is receding in countries such as South Africa and Kenya. Remittances are dropping in Liberia. Aid flows from economically stressed donor countries might retreat. Much will depend on how quickly advanced economies recover, according to experts and African leaders, who warn that a prolonged downturn could stir turmoil. Among the hardest-hit African nations is copper-rich Zambia, which derives about two-thirds of its export earnings from the metal. The industry boomed as the price of copper soared to more than $8,000 a ton last summer, helping drive Zambia’s 5.8 percent growth rate for 2008. By December, when the price had fallen more than 60 percent, the mines, which had spent billions in recent years on exploration and new technologies, began operating at losses. In recent days, the price has been about $3,900 per ton. The nation’s currency, the kwacha, has tumbled more than 70 percent against the dollar since last summer. Zambia’s government predicts 5 percent growth this year, a rate economists say would be miraculous. Most forecast growth of 2.5 to 3.5 percent. Scrambling to deal with the crunch, Zambia is seeking a $200 million emergency loan from the IMF. It has extended a carrot to mining houses by scrapping a major tax on their profits. To curb dependence on copper, the finance minister has proposed boosting funds for agriculture, tourism and infrastructure — key, experts say, to developing industries in a landlocked nation with few paved roads and a dismal power system. But the timing might be all wrong, some say. According to unions, mines have shed nearly 10,000 permanent workers and thousands of contractors and suppliers, and more layoffs are in the pipeline. Those numbers are significant in a nation with a formal workforce estimated at 400,000, 10 percent of which is employed in mining. Government officials have said they are pressuring limping mines to surrender their assets to the state and can quickly find new owners, a claim industry executives and economists doubt given the global credit crunch. Officials said one firm interested in the Luanshya mine is NFC Africa, a Chinese company that runs one Zambian mine. That is a wildly unpopular option among many miners and officials, who complain that the firm pays poorly and provides unsafe working conditions. In this Northern Province, copper is the lifeblood. Nearly all mines provide schools and hospitals for miners and their families, and salaries of at least $200 a month provide something resembling a living. The mines were privatized in the late 1990s, and their expansion since then has had a ripple effect. Guesthouses sprang up to lodge visiting executives from Canada and India. Grocery stores and bars serving miners mushroomed. Though little wealth trickled down, state data indicate that steady economic growth has coincided with reduced poverty in urban areas. Now, copper is driving things the other way. The Mining Mirror newspaper is in danger of folding because of plummeting ad revenue. Copperbelt soccer teams have lost sponsorships from the mining houses, and the massive Konkola Copper Mines has stopped paying the salary for the coach of the national team. Traffic on the roads has slowed, and goods are expiring on store shelves. Over the past year, malnutrition among children younger than 5 has jumped 15 to 20 percent in urban areas, including Copperbelt towns, said Pablo Recalde, country director for the World Food Program. Luanshya Copper Mines, one of Zambia’s smallest, shut down in January, and 1,720 miners were let go. The maximum severance pay was 10 months’ salary, money that in many cases was immediately devoured by bank loans, said Stanslas Mwimbe, a Luanshya representative for the Mineworkers Union of Zambia. Though few in town worked there, Kambwili, the parliamentary representative, estimated that the mine supported 90 percent of Luanshya’s 180,000 residents. The mine still allows miners’ families to use its school and clinic free of charge. But in interviews, several residents who did not work there — but whose businesses thrived on miners’ consumption — said they were unable to pay for health care or public school fees. Kambwili said he thinks the frustration will soon explode if the mine does not reopen.